Many times one injury will lead to another injuries. A prime example of this is in the shoulder. Your shoulder injury will lead to another injury in your arm or upper body. 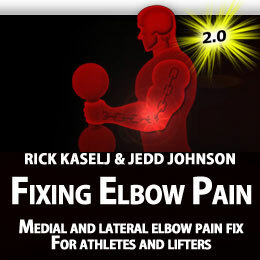 Often times that second injury is the elbow. How Can My Shoulder Pain Lead to Elbow Pain? All of these other areas work harder to decrease the stress and load on the shoulder. Eventually one of these areas goes. The most common area to go is the elbow. What is the Most Common Elbow Pain? The most common elbow pain is tennis elbow pain. Tennis Elbow is when the muscles in the elbow that move the wrist back get over worked and injured which leads to pain. I hope you took a minute to try out the tests. If not, go back and do them while you are watching the video. What to do about Tennis Elbow Pain when it Relates to the Shoulder? A key thing is working on the scapular muscles. I go through this in the shoulder pain program. Improving the activation, endurance and strength of the scapular muscles will help the shoulder recover and decrease the stress on the elbow. What can I do about my Tennis Elbow Pain? My specialization is shoulder pain but I also help other health & fitness professionals design exercise programs for people with injuries. I do this with live courses that I run in Vancouver, BC, Canada but I also do this with my Injury of the Month (IOTM). With the IOTM, it put together an exercise program for a specific injury and this month the injury is Tennis Elbow Pain. This entry was posted on Friday, January 27th, 2012 at 7:46 pm	and is filed under Shoulder Pain. You can follow any responses to this entry through the RSS 2.0 feed. You can leave a response, or trackback from your own site.